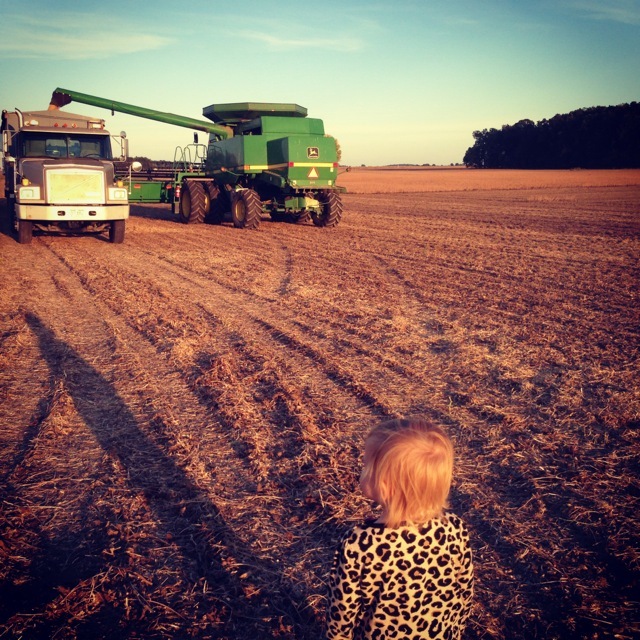 As we share thanks this season, farmers have a lot to be thankful for. a day off. My sheep are part of my family and they have to eat everyday. We will be up early as always and in the barn late into the night on Labor day as every other day. 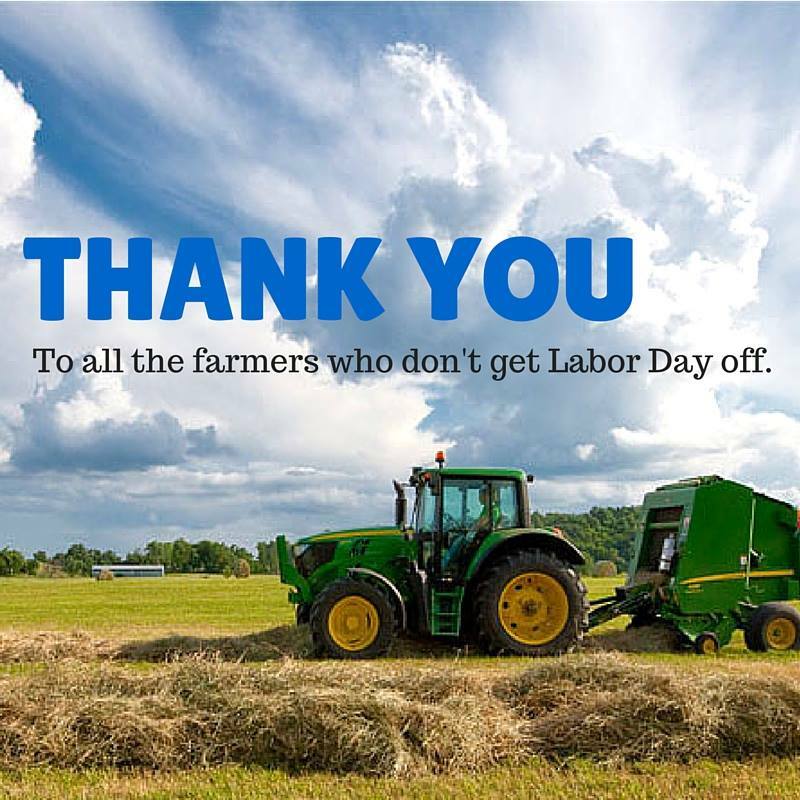 While we aren’t in the fields yet, there are many farm families who won’t get a day off of harvest this weekend. When the crop is ready and the weather is right you keep going! Not everyone is willing to work a job with no days off, let alone deal with the risk and stress involved in the job. As you stop to barbecue with our friends. Please take a second to thank the farmers who are providing that food for you, because they are probably on a tractor somewhere! Thank you to my Farmer! As the new Fall Semester gets underway there are a few things I want to share with you from a professor. We know you are anxious this first week about how your classes will go. Guess what? So are we! Is our class ready? Are we ready to teach, grade, and engage you? Is our material challenging enough to push you to grow and learn without pushing you too far? Over the summer while you were working and enjoying the warmth, I was at conferences trying to learn to be better for you. I am constantly thinking of how I can be a better teacher for you. How can I be the one who helps you think critically about my content? How can I be a support for you during your time here? 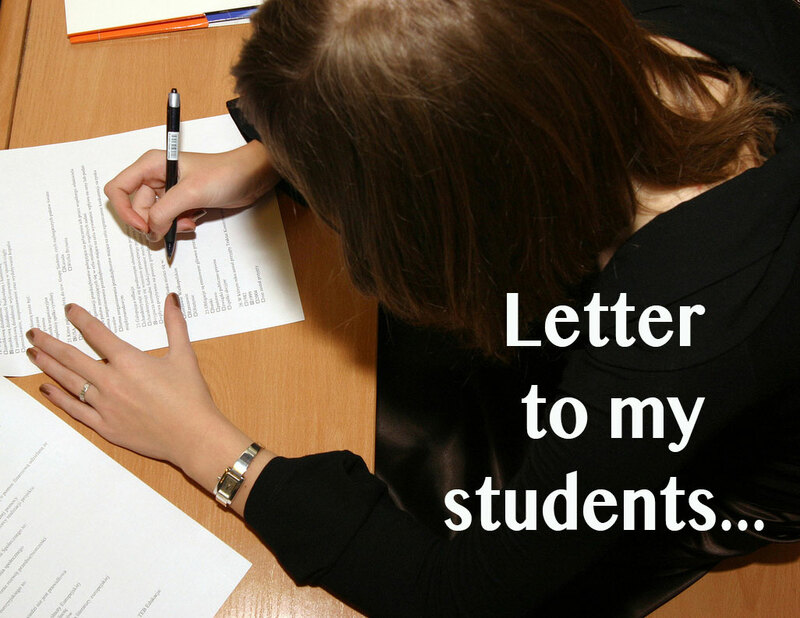 How can I make the impact on you that my teachers made on me? How can I make you the best you to have a great future? I’m human too… I have a family and there may be times I can’t respond to your email or text right away. Please be patient and know I want to answer you quickly, but my family comes first. I’m respecting you by putting effort into every class session we have together and giving you feedback on your work. Please respect me by coming to class ready to learn. I love being on my phone connected to my friends and family too, but during class I put it away so I can focus on you. Please show me the same respect. Please think before you ask. Was what you are asking something I already said? Was it on the syllabus or course site? Is it something you can look up your self? I’m always learning too. Can I do something better to help you learn? Please tell me. I want you to get the most out of my class you can, and I know I’m not perfect. I’m not a mean person. If you don’t understand please ask me. I want you to learn and I will do all I can, even meet with you one-on-one. But if you don’t tell me I may not know. Please never be afraid to approach me. If you need help come see me. And I don’t just mean in my class. I’m here to help you navigate this big place! I hope that you have an amazing year. I hope you get all you can from my class and others. College is one of the best times of your life. 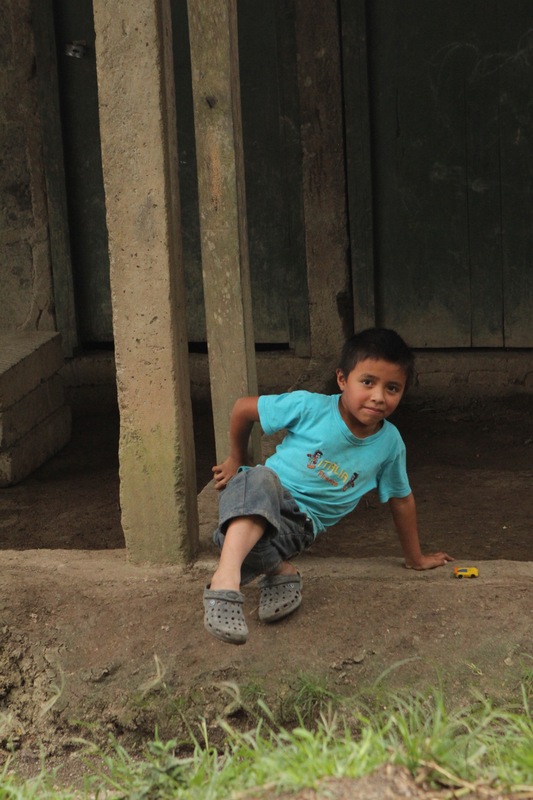 It is more than in the classroom. I know that (remember I went to college too). I want you to get a great degree and career. Know I am here to help you get there and as long as you respect me I will respect you. Have we lost sight of the meat? Being short, the size of my sheep has always been important to me. I don’t want to breed something that is going to be taller than me and over power me. 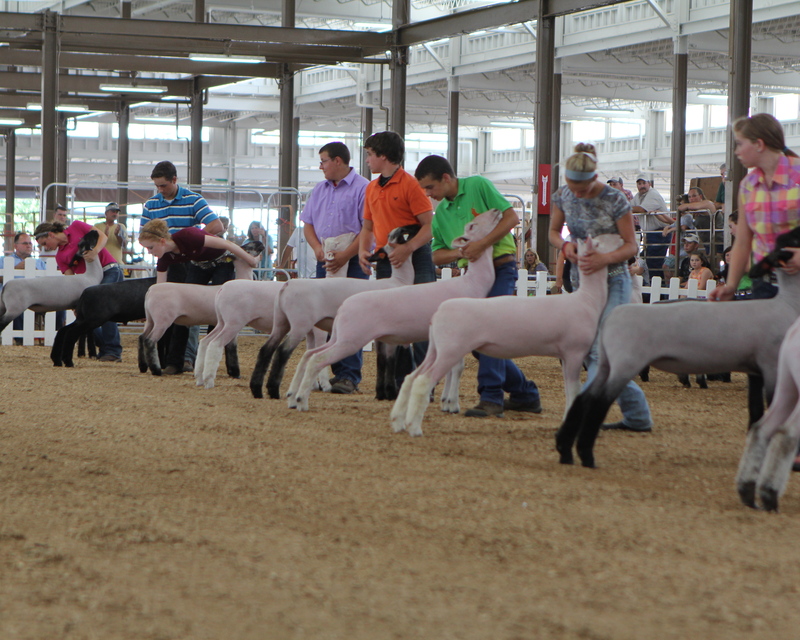 Recently, I was talking to a judge at our state fair about the “growth” of our sheep industry, not out but up! We continue to breed and judge for height while breed standards and conformation get ignored. We will get to a point that they are too tall and the meat processors won’t be interested, i.e., the cattle industry. Over the years we have seen beef make that move to taller stock, but that has taken a swing in a different direction. One I think we in the sheep industry should follow. They aren’t worrying about height as much as build, muscle, etc. And we are seeing them get progressively shorter. As I see sheep in other countries, I’m always jealous of their standard heights. These Suffolks form a show in Scottland are a great example. When was the last time you saw a Suffolk like this? Most in the US are taller than me! (ok maybe a little exaggerated, but not by much) If we are to compete in a global market we should be breeding for wool, conformation, meat quality, but not height. Height doesn’t increase the value at the end of the day, it is a wasted product. As breeding season hits think about what is most important in your genetics? Your breed integrity and quality, or being the tallest in the class? Realistically I know it will take a swing in the show ring as well, but that won’t start if we don’t start talking to our judges and breeding as we should. I know many bloggers have given their two cents on lessons learned in the show ring every year and what we are teaching our children, but after a few weeks of watching another fair I can’t help but add in my opinion! A little background… I grew up in a very competitive county where showing market lambs was big business, but thankfully my parents steered me in another direction… breeding sheep. I showed a market lamb every year, but I wasn’t out for champion. I was more excited to show my breeding sheep. I quickly learned the lesson of hard work all year ensuring you are producing a quality animal that was ready to produce offspring, not just win a ribbon. And this is where I worry we are going wrong today. At the state fair every year we see market lamb numbers go up or stay level, but kids showing breeding sheep keep declining. Yes youth learn skills in the market industry, but I think it is also important they are learning the importance of what is needed in the breeding barn to produce the wool and meat needed around the world. I’m not blind and I know some treat even their breeding flocks as show strings, but I think our youth should be learning about the whole industry, not just how to fluff legs right. In a recent trip to the UK, my students (who grew up in the show stock world) and I watched a couple classes of sheep at a national show. There wasn’t a market lamb class, it was all breeding sheep and people were not “showing” them as we would see in a US show ring. It was fun to watch, but my students were in awe. 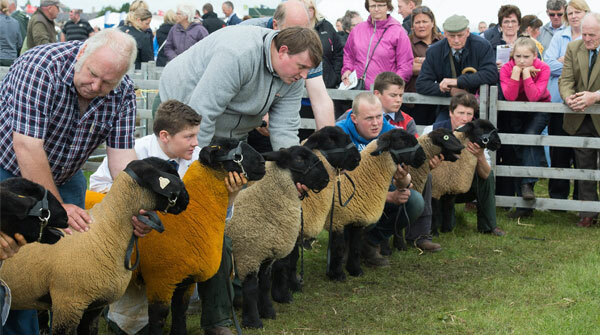 I think for our industry to grow and continue we need to be developing youth who have a passion for breeding and raising sheep, not just making sure they are fresh the day of the show. Just as you’re open to someone’s race, please be open to understanding us as the farmers who feed your family. Our farm is an LLC, not because we’re out to make money, because we have to protect ourselves legally. Farmers employe help during planting and harvest, not because were a large corporation trying to grow , but because this isn’t a one-man job. Every year we put hundreds of thousands of dollars on the line at the mercy of mother nature and economic markets around the world. We gamble, and some years maybe we make money but other years we struggle to pay bills, if we even can, all while trying to feed and clothe our family just as you do yours. We want to take vacations just like you do, we want our daughter to have a good college education, just like you do. And so we try to grow our operation not to be greedy but to make money when we can to balance the bad years with the good. Every trip across the field whether it’s spraying chemicals, planting, or harvesting costs us money, let alone puts off emissions into the environment. So we’re not going to do it anymore than we absolutely have to. We’re not going to put on pesticides just to throw on pesticides, we only do it when we need to to produce a healthy crop. On our farm we do no-till to reduce our trips across the field compacting the soil and hurting the environment. We soil sample by the acre and only apply fertilizers and pesticides on the square foot of soil that needs it, and only just to make it grow well. We don’t want someone to stereotype based on the color of their skin, so why do you stereotype me as a Farmer and how I care for my livestock. My animals are part of my family; they eat before we do. No one opens Christmas presents or goes to church before the animals get their breakfast. I will stay out in the below zero temperatures all night long to make sure a lamb survives. I don’t abuse my animals to make money, I take care of them. But yes they are business. If you were a hairdresser would you think you could just go in and start chopping someone’s hair and be successful? No, just like I couldn’t go in and harm my animals and still have money to feed my family. My sheep get antibiotics when they’re sick because I want them to live. My daughter gets antibiotics when she’s sick because I want her to live. Please don’t stereotype my family for the profession we have. As educated consumers you can’t believe the images and the stereotypes always put before us in the media when it comes to race, religion, sexual preference, or gender, so why do you take everything for face value when you see something negative about my family. I’m not against being a vegetarian, I’m not against organics, I’m not against GMO or chemicals. I don’t make my mind up based on one blogger’s opinion or one news report. I do research myself, and I look at all the facts and where those facts come from before I make an informed educated decision. Please get to know all sides of agriculture before you lump us all into one stereo typical box.